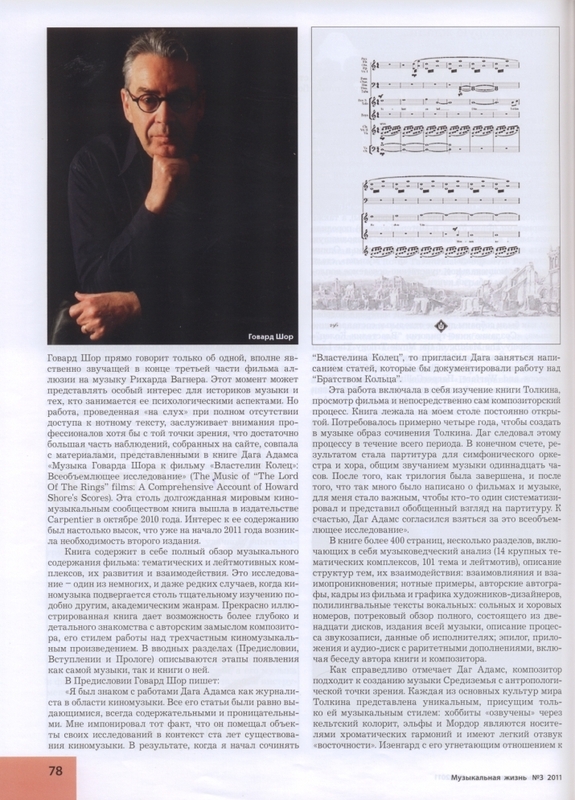 This article from Russia's Musical Life magazine has been under construction for quite a while now. Big congratulations to Elena for seeing the piece through; she's now a published journalist! Brava! The Book They Were Waiting for…. Interest in the music for the film “The Lord of the Rings” by the Canadian composer Howard Shore – who has received many professional awards, for example, three prized Oscars (in 2002 and 2004), three Grammys and Golden Globes (2004, 2005) – has not died down in the ranks of those who value film music from the moment of the appearance on the screen of the first part of the trilogy. Even in 2001 it was clear that the combined collaboration of the composer with the artists Alan Lee and John Howe (conceptual designers), Richard Taylor (visual design and special effects), and also the scriptwriters (Fran Walsh and Peter Jackson) had produced a unique audio-visual matrix, resulting in their being able to construct an effect of the “reality” of the world of Middle-earth. One of the pillars of this triad “text – graphic art – music”, was the audio and emotional, the sensual-tangible, incarnation of the heroes and events of the Tolkien books on the screen and in the minds of the viewers. 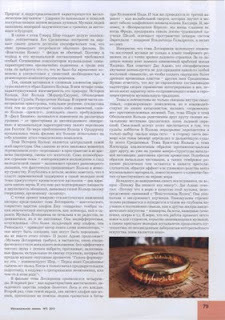 Then, at the beginning of the 2000’s, talk began about the necessity to systematize the musical material in the same way the other aspects of the film had been collected: “The Making of the Movie Trilogy, The Lord of the Rings”, Brian Sibley, Houghton Mifflin, 2002; “The Lord of the Rings Weapons and Warfare,” Chris Smith, HarperCollins Publishers, 2003; “The Lord of the Rings Complete Visual Companion”, Jude Fisher, Mariner Books, 2004; or “The Art of the Lord of the Rings”, Gary Russell, Mariner Books, 2004. Over the course of eight years Doug Adams, an American critic of film music and journalist, in direct contact with the composer occupied himself with research into the music of the trilogy. Adams received his musical education in the realm of classical and contemporary music in the University of Illinois and Roosevelt University (Chicago), achieving a Bachelors and Masters in Music. In the 90’s he worked as an independent critic for the journal “Film Score Monthly” where he discussed the film music of such composers as Danny Elfman, Howard Shore, Phillip Glass, Quincy Jones, Elmer Bernstein, David Raksin, Elliot Goldenthal, Michael Giacchino, Don Davis, John Corigliano, and many others. Adams is well known in foreign film music circles, and is frequently invited to give public lectures world-wide. 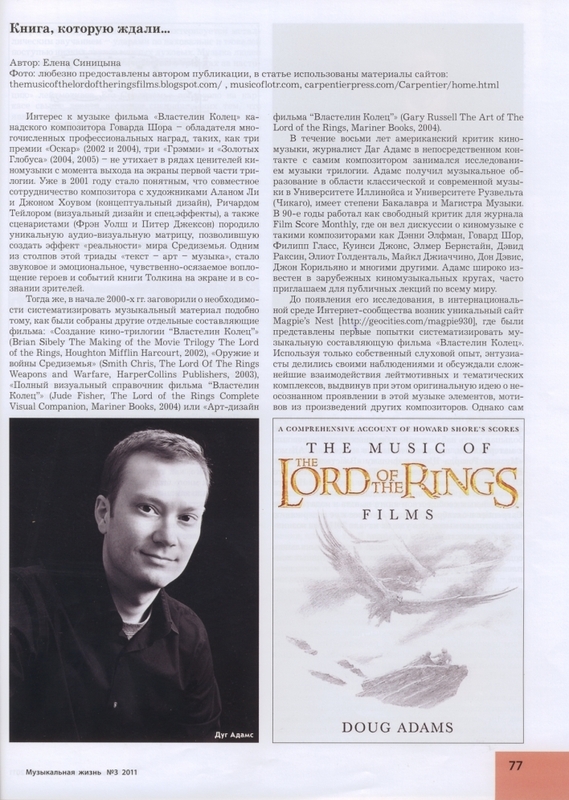 Prior to the appearance of his researches, there appeared a unique site on the international Internet called Magpie’s Nest, where the first attempts to systemize the musical content of the film “The Lord of the Rings” were presented. Using only their own auditory experience, enthusiasts made their observations and discussed the most complex interrelationships of the leitmotivs and thematic structures, advancing in this way original ideas that there were subconscious manifestations of musical elements, motives, from the works of other composers. However, Howard Shore himself frankly speaks of only a single, fully obvious, audible allusion to the music of Richard Wagner at the conclusion of the third film. This factor may be of special interest for music historians and those who study its psychological aspects. But work gained “by ear” without any access to the written score, is of benefit to professionals only from the point of view that a sufficiently large number of observations found on the site coincide with the material presented in the book by Doug Adams “The Music of the Lord of the Rings Films; A Comprehensive Account of Howard Shore’s Score”. This book, so long awaited by the world of film music, was published by Carpentier in October of 2010. Interest in its contents attained such a high level that as early as the beginning of 2011 it became necessary to issue a second printing. The book contains a complete survey of the musical content of the film: the thematic and leitmotivic complexes, their development and interrelations. This research is one of the few, and even rare, cases when film music has been subjected to such thorough study as are other more academic genres [of music]. The splendidly illustrated book provides an opportunity for a deep and detailed acquaintance with the composer’s creative thought, his style of working on this tri-partite film-music work. In the introductory sections (Foreword, Introduction and Prologue) the stages of the appearance of both the music itself and the book about it are described. “I was first aware of Doug Adams’ writing as a film music journalist. His work consistently stood out. It was always thoughtful and insightful. I enjoyed the fact that he would place his subject’s work within the context of one hundred years of film music. As a result, when I began writing The Lord of the Rings, I invited Doug to write an article documenting the work on The Fellowship of the Ring. There are more than 400 pages in the book, with several sections comprising the musicological analysis (14 large thematic complexes, 101 themes and leitmotivs), a description of their structure and their interrelationships: their mutual influences and mutual interpenetration; musical examples, the composer’s autographs, personnel from the film and graphic artist-designers, complete linguistic vocal texts of the solo and choral numbers, a full track by track review of 12 discs of all the published music, a description of the process of recording, facts about the performers; an epilogue, appendix and an audio-disc of added rarities, including a conversation of the author of the book with the composer. As Doug Adams rightly notes, the composer approached the creation of the music of Middle-earth from an anthropological point of view. Each of the important cultures of the Tolkien world is represented by a musical style unique, natural, to it alone: the hobbits “are given voice” through a Celtic coloration, the Elves and Mordor appear through chromatic harmonies and have a light echo of the “orient”. Isengard and its oppressive relationship with Nature and its industrialization are characterized by a metallic sound – strokes on anvils and the heavy tread of the lower notes of the brass instruments. The music of a people with its minor mode thoughts filled with anxiety for the present and the future. 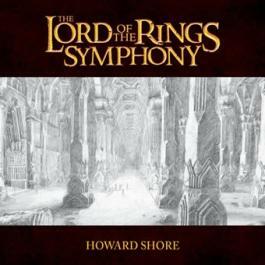 In connection with this, Howard Shore creates a whole “collection” of leitmotives. His Middle-earth is built on the framework of more than ninety specific themes, which clearly surpass the needs of the usual film. But “The Lord of the Rings” is not a typical film. Thus the approach to its musical content demanded something special. The qualities of the musical themes of the composer are extremely flexible, and among them one rarely finds something that was not a variation altered in conjunction with the demands of subject-matter and the conductor-composer’s vision. Thus the most active and complex element in the score is the image of the One Ring. It has four themes characterizing the multidimensionality of its nature: The History of the Ring, The Evil of the Ring (Mordor/Sauron), The Seduction of the Ring, and The Fate/The Destruction of the Ring. In the first part of the book’s trilogy [“The Fellowship”] the orchestration, the tonal resolutions, the characteristics of these themes do not undergo any changes, in a word, the Ring “sleeps”, awaiting its awakening. In “The Two Towers” the changes begin on various levels – from orchestration to an intonational “intertwining” with the musical characterization of a character like Gollum. As the Ring nears Orodruin the musical fabric of the film more and more experiences the influence of this thematic complex. 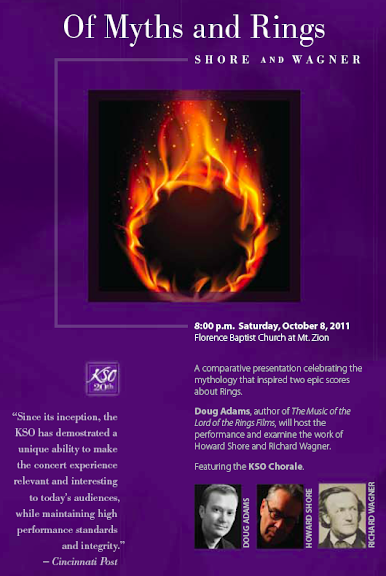 The theme The History of the Ring becomes the central theme of the entire score. It is heard during all the significant moments of the transfer of this “character” through space and time (for example, when it changes hands). The very wave-like structure of the theme – imitated in the rise and fall of the melodic line – suggests the process of measured breathing that concretely equates the Ring to a living being. Delving into the details one can notice that on the level of the harmonic underpinnings the very melody of this theme presents a chromatic layer – two [harmonic] variants in a single sound. And this further affirms the falseness and duplicity of the promises made by the power of the Ring to its next, temporary “keeper”. In the films the Lothlórien theme appears in four guises. In the first instance – as characteristic of the mystical, enigmatic realm of the Elves’ Golden Forest and its mistress. The second time taking on the qualities of a march, it depicts the Elves as warriors coming to help mankind fight at Helm’s Deep. Also there a third variant is introduced – a comforting death which is heard at the moment the Elvish march-warden Haldir perishes. And finally in “The Return of the King” we again hear it when Frodo penetrates through the lair of the monstrous spider Shelob, when he illumines the space of the caves with the light of Elendil – a gift of the Lady Galadriel and he has a vision of her. It is interesting that the Lothlórien theme utilizes elements of oriental music not only on the level of the timbral choices, but also from the point of view of its modal structure. Its modal foundation gains slight changes from the Arabian maqam hijaz. As Doug Adams notes, its specific sound is not used for its evocation of any oriental “exotic otherness” but to create a sense of even more ancient layers – the other epochs of Middle-earth. One notes that all the non-European elements of the score are harmoniously integrated into it rather than having a character of something imposed from outside the Euro-centric musical tradition. The themes and leitmotivs are not only connected by their inner meanings, as complexes “with a single root”, but act on each other in an antagonistic manner, as expressions of “hostile” contradictory phenomena. Thus the themes of the Shire and the theme of the Seduction of the Ring are related to each other by their principle motives (distinguished only by the modal coloration). The significance of this is found in that the destiny of the Hobbits and the Ring are inseparably interwoven in just the choices “of this tiny world” – in the aspect of light (major) and darkness (minor) determine the further destiny of all of Middle-earth. The theme of the Fellowship of the Ring and theme of Isengard are in an analogical way contrasted with each other, but as well on the level of the micro-structure of the basic intonations: diatonic versus chromatic. Similar to the basic intonations the timbral choices of various themes linger in the memory of the viewer-listener, forming an impression of the musical material of the scarcely perceptible kind telling us of the unique reality in the world of film.